As justification for bringing back the unpopular fees, the mayor's office told the Sun-Times that "three out of 50 aldermen prefer to restore paid Sundays in certain areas..." These three aldermen are Scott Waguespack (32nd), Tom Tunney (44th) and John Arena (45th). The reinstatement of Sunday parking fees is set for a vote in a City Council meeting in May, and would go into effect shortly thereafter if passed. These alderman -- whose districts include neighborhoods such as Lakeview, Wrigleyville, Wicker Park and Lincoln Park -- support bringing back Sunday rates because they say businesses are suffering from lower customer turnover due to cars that park for long periods of time on Sundays. Local businesses and chambers of commerce complained. Just like the rest of us, the aldermen may just be trying to make the best of an awful situation, and at this point it seems that no solution will be ideal. But that does not mean that Chicagoans should have to continue to fork over more of their hard-earned money to a meter in order to do their Sunday shopping. More parking fees cannot escape symbolizing another step along what seems to be the never-ending path toward corporate privatization of our city. If our aldermen truly had the interests of their districts in mind when it came to parking, they should not have supported the parking deal in the first place (although Waguespack was one of only five aldermen who voted against the parking meter deal back in 2008, and he should be applauded for this). Last year, Emanuel traded extended parking meter hours on other nights of the week for free Sunday parking. Free Sunday parking outside of the Central Business District (a.k.a. downtown) had been viewed as one small boon to the public in Emanuel's failure to significantly alter an otherwise horrendous deal. Although the new mayor claimed that he was against Daley's deal with CPM, this was the only concrete gain to come out of his renegotiation. The free Sunday parking took effect in June 2013, meaning the city's drivers won't even get a full year of the renegotiated rates. Although extended hours were supposed to be a trade for free Sundays, Emanuel is not trying to trade this back. City drivers will have to continue to pay until 10pm in most places once Sunday fees are re-established, and Emanuel plans to have the extra revenue go toward what Chicago owes CPM for days when parking is closed off for various reasons. This amounts to a not-so-subtle way of making residents pay out of their own pockets for our government's mistakes. The reinstatement of Sunday fees will be another win-win for CPM, which is mostly comprised of Wall Street investors who do not even live in or contribute to the city's economy. The corporation made a profit of a whopping $139.5 million in 2012 -- up from Chicago's $23.8 million in 2008 -- and the company projects that their annual profits will reach nearly $162 billion by 2020. As city residents have heard countless times by now, CPM paid the city a measly $1.2 billion for their 75-year lease on the meters. 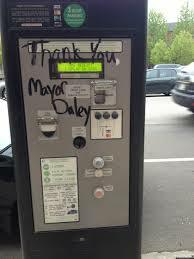 Hopefully, his decisions on parking meters will not prove to be a win-win for Emanuel when election time rolls around next year. If Emanuel's administration truly wanted to do away with the parking deal, they could have supported lawsuits questioning its constitutionality, or found some other way of challenging its validity. Instead, Emanuel instructed his legal team to actively defend it, and attempted to appease us with free Sunday parking. But as the city continues to privatize its assets to the detriment of its residents (most recently with the loathed Ventra system), it is simply not fair to take away this one promised free day. Once again, the mayor has gone back on his promise to voters, in favor of special and corporate interests. It would be one thing if at least the revenue from these increased parking meter rates went to the city. But as it is, it feels like a stab in the back to residents who will now be stuck with paying for exorbitant parking essentially 24/7. The real problem is not whether meters charge on Sundays. It is certainly not a few aldermen trying to negotiate in favor of their districts. Rather, this is just another symptom of the larger issue -- the corporate privatization of Chicago, our central assets which city officials continue to sell off willy-nilly. Within the context of continued corporate appropriation of our city's resources and services, Emanuel's call to reinstate Sunday fees is yet another blow against the 99 percent.